The Academy of Graphics and Publication at Santa Susana High School is a nationally recognized program of excellence. Top yearbook in the nation five times. 100% AP Studio Art pass rate for 12 years! Student have gone on to Art Center, Cal Arts, Cal Poly San Luis Obispo, Otis, School of Visual Arts NYC, Cal State Northridge, FIDM, Gnomon, and San Diego State University. Former students have also found employment at Disney Imagineering, Sephora, Urban Outfitters, and Jakks Pacific doing design work. 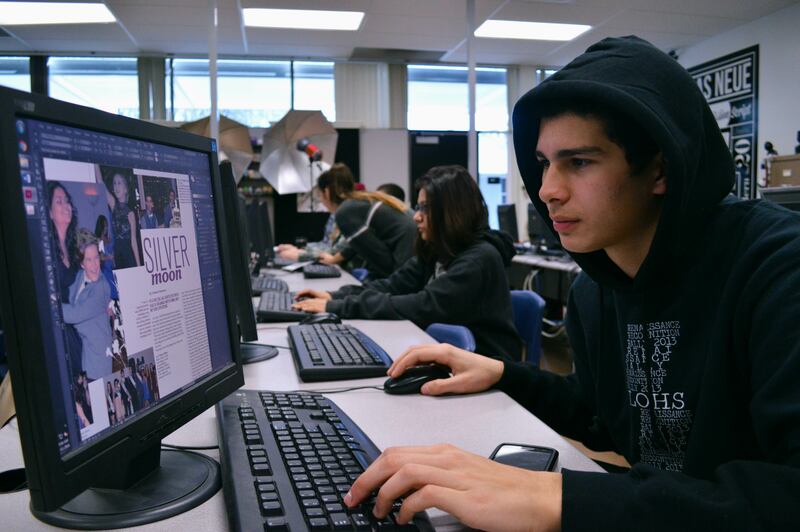 The Academy of Digital Graphics and Publication at Santa Susana High School is a nationally recognized program of excellence. The Academy of Graphics and Publication at Santa Susana High School is a nationally recognized program of excellence in the area of Arts Media and Entertainment which encompasses a comprehensive, rigorous series of courses designed to teach students professional level art and technical design skills. Students will learn Adobe Photoshop (editing images), Adobe Illustrator (digital illustration), Adobe InDesign (layout). They will also work with an SLR camera exclusively using the professional settings, utilize reflectors and studio lights, create graphics for various projects, internship (work on real projects for real clients) and earn up to six units (two classes) of college credit along the way. The academy includes six courses, totaling up to 60 units of course work. Other software programs may include Adobe Premier (video editing), and Adobe Animate (2D animation). The capstone course for the Academy of Graphics and Publication. This is a two period (double honors credit) class which is for college credit (3 units) if you receive an A, B, or C in the class. We work with Photoshop, Illustrator, and InDesign to create Cereal Boxes, Packaging, Vector Art, Tee Shirt Design, Silk Screen, Album Design, Posters and Advertising, Typography, Yearbook Cover Design, Currency Design, Logo Design, Business Card Design, Corporate Branding, Menu Design, Billboard Artwork, Magazine Covers and Layouts, and Computer Animation. There are also internship opportunities. This is a yearlong class designed to create the school yearbook and supplement. Five times our book has placed #1 in the Nation in the American Scholastic Association National Yearbook Competition in New York. As a class we create a theme, design spreads, cover and utilize photography. We cover events through journalism and photography, place content in layouts, and proof our work. At the end of the year we create a supplement to the book which has been either an interactive interactive app, or interactive PDF. This is a yearlong Digital Photo class which covers how to use a professional camera, and identify elements and principles in your work. This leads to working with studio strobes, reflectors, and doing fashion shoots, which include modeling, styling, hair, and makeup. These images are then post processed in Photoshop for use in Graphic Design related projects. In the past twelve years, 100% of our students who have turned in a portfolio to the College Board, have received college credit, totaling over nearly 400 students. Students learn to use an SLR camera at an advanced level. Covering ISO, Aperture, Shutter Speed, and Manual Modes. We learn composition, shoot elements and principles, editing techniques in Photoshop, and use reflectors for fashions shoots. ‍A hands on course focusing on Design (Planning), Manufacturing (Building), and Entrepreneurship (Selling). Students learn Adobe Illustrator (2D) to draw plans, and Sketch-Up (3D) to visualize these designs in a computer 3D environment. Students will also learn how to use practical tools like a drill, table saw, skill saw, router, etc, to create and build what was drawn on the computer. While in this class we may do projects that use various software programs, do small woodshop type projects, build pallet furniture, learn how to frame a wall, design a cabin, render it in Sketch-Up, then build a scale model in reality, design a product of your choosing, make it, then sell it, design and build a real teardrop trailer, and address the construction of a tiny house. For more info on this specific course, please see Mr. Abbe in room 203 and click this link. Must take Honors Graphic Design ROP capstone class and complete a senior project. Click to see past books.